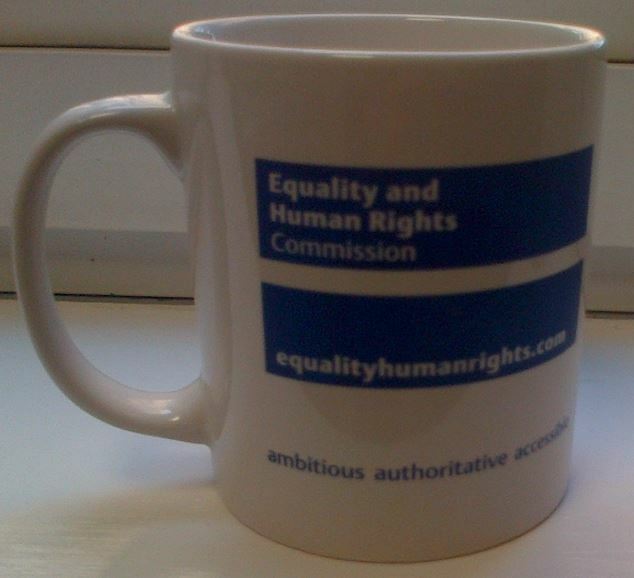 Never has a mug arrived at our door from such a lofty and prominent organisation. Always one to shy from controversy I’m going to side-step the usual japery of light-heartedly sending up such an institution. Let’s face it, under-represented humankind has many wishing to speak up to fight their corner and raise awareness of even the most niche cultures and communities. What concerns me are the Rights of Trade Mugs? Sadly even in Trade Mug circles, those who shout loudest are pandered to. The landscape is awash with White-bread Sparta’s & Vanilla Cambridge’s but wherever possible we love to champion those under-represented mugs sitting on the fringes: the Bell; the Stein & the Tankard. Hardly any of these get a look in!. It’s a pity then that the E&HRC chose the most glaringly obvious, safe and quite frankly bland Cambridge to promote their cause. This is pretty much sat on the earthenware fence. I’d have much more respect for them if they’d had plumped for something like the Brave Bell. Maybe rather than offend the majority by being brave, they pandered to the masses? You have to remember: All trade mug designs are equal but some are more equal than others. “Lies, Damned Lies & Statistics” is a phrase used to describe the persuasive power of numbers, particularly the use of statistics to bolster weak arguments. What we can’t wriggle out of is the fact we have a stunningly-modelled artifact courtesy of our Cardiff-based branch of Mugspotters, received via Twitter. I’ll tell you it’s a Bell, despite not being able to see the handle but purely based on the ‘lipped’ aperture and well-rounded base. 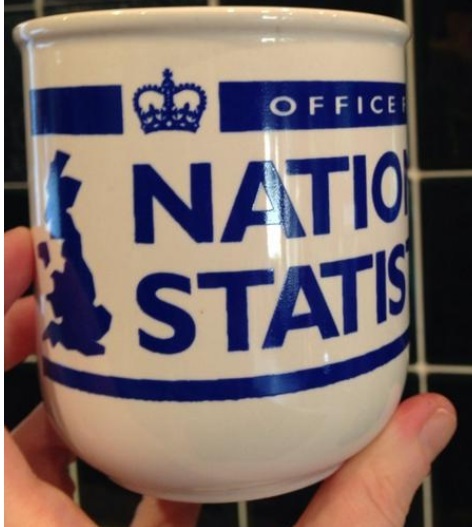 I can’t even fully see that it’s promoting the Office for National Statistics. I’m assuming. You’re all believing. Let’s face it, we are fed stats and figures every day without any context and we’re expected to gobble them up. Don’t believe everything you read on the internet or hear on the news. 87.34% of all statistics are made up. Honest.